Thank you Nuffnang for the invitation! The G.I. Joes are framed for stealing nuclear warheads from Pakistan by Zartan (Arnold Vosloo), who is impersonating the President of the United States (Jonathan Pryce). The entire team is eliminated in a military strike, including Duke (Channing Tatum). Roadblock (Dwayne Johnson), Flint (D.J. Cotrona) and Lady Jaye (Adrianne Palicki) are the only survivors. Meanwhile, Storm Shadow (Lee Byung-hun) and ex-Joe Firefly (Ray Stevenson) rescue Cobra Commander (Luke Bracey) from a penitentiary in Germany. Storm Shadow is injured during the escape and retreats to a temple in the Himalayas to recover. Upon learning that he is alive, the Blind Master (RZA), leader of the Arashikage Clan, sends Snake Eyes (Ray Park) and his apprentice Jinx (Elodie Yung), Storm Shadow's cousin, to capture Storm Shadow, so he can answer for the murder of his uncle, the Hard Master. Roadblock, Flint and Lady Jaye return to the United States, where they set up a base of operations in a rundown gym. After Zartan announces that Cobra will replace the Joes as America's main protective unit, Lady Jaye deduces that someone is impersonating the President, and Roadblock leads them to General Joe Colton (Bruce Willis), who provides them with weapons and helps them infiltrate a fundraising event that the President will be attending, where Lady Jaye steals a sample of his DNA and confirms that he is Zartan. They escape after a brief confrontation with Firefly and cobra operative Zandar (Matt Gerald), the head of the Presidential Detail. Snake Eyes and Jinx locate and capture Storm Shadow after a battle with ninjas, and take him back to Japan, where Storm Shadow reveals that Zartan murdered the Hard Master, and he joined Cobra to avenge his uncle. Storm Shadow then accompanies Snake Eyes and Jinx as they join the Joes' efforts to stop Cobra. Zartan invites the world leaders to a summit, where he blackmails them into disabling their nuclear arsenals, and reveals that he has seven orbital weapons of mass destruction at his command. He destroys London to prove his superiority, and threatens to destroy other capitals if the countries don't submit to Cobra. However, Storm Shadow betrays them and kills Zartan, revealing Cobra's deception to the world leaders. While Snake Eyes, Jinx and Flint fight Cobra's soldiers, Cobra Commander activates the remaining six weapons and instructs Firefly to protect the launch device, but Firefly is killed in combat with Roadblock, who deactivates and destroys the orbital weapons, saving the world and proving the Joes' innocence. Colton and Lady Jaye infiltrate the White House with help from Colton's old army buddies, kill Zandar and rescue the President. However, Cobra Commander escapes during the battle and Storm Shadow disappears after avenging his uncle. The President initiates a manhunt on Cobra Commander, and reinstates the Joes with Roadblock leading Flint, Lady Jaye, Snake Eyes and Jinx, and recruiting more soldiers to join them. Roadblock swears to avenge Duke's death by capturing Cobra Commander. 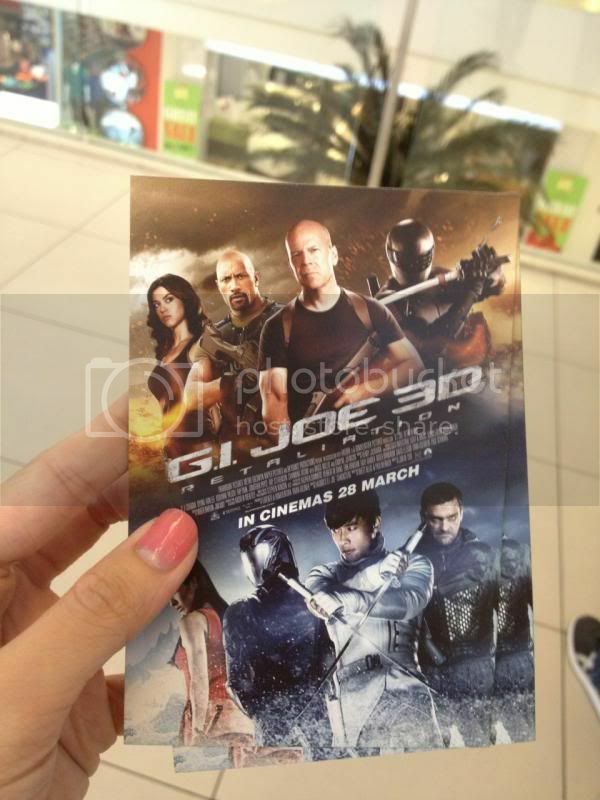 I did not watch the previous sequel of G.I Joe: The Rise of Cobra but overall it wasn't that bad. However, I wish that Duke (Channing Tatum) can act in the movie longer because he is damn HOT! Too bad he died in the beginning of the movie. Sigh. Anyway, I'll rate this 4/5.